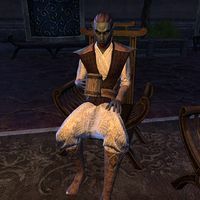 Alberic Drenim is a Dunmer noble who can be found in the Saint Olms Waistworks in Vivec City. He is located in the plaza and sits either in the southwest corner or in the center of the room by Fabremund Ragon, reading a book in both spots. Alberic has no unique dialogue. This page was last modified on 8 July 2018, at 08:00.